13TH JULY 1917: Pte BERTIE HIBBETT IS DISCHARGED THE ARMY ‘BEING NO LONGER FIT FOR WAR’. 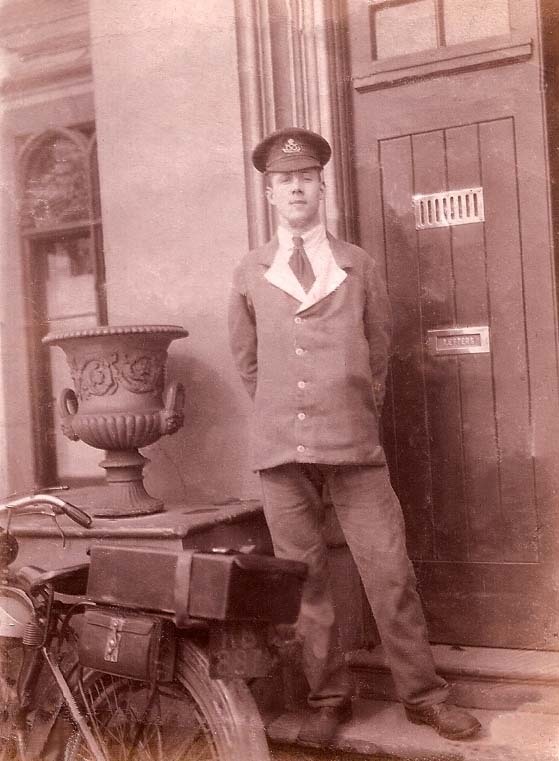 Pte Bertie Hibbett & Bike. The Cenacle Red Cross Hospital. April 1917. Pte BERTIE HIBBETT, 200245 1/5th South Staffordshire Regt. – a Soldier of the Territorial Force – was Discharged from the Army on 12th July 1917, his 22nd Birthday. He had served Two Years 322 days, and survived One Year & 123 days in France & Flanders. ARMY FORM E. 511: If this certificate is lost or mislaid no duplicate of it can be obtained. TRANSCRIPT This is to certify that 200425 Private Arthur Hubert Hibbert 5th South Staffordshire Regt. who was enlisted to serve in the Territorial Force of the County of Staffordshire on the 2nd day of September 1914 is discharged in consequence of * Being no longer Physically Fit for further War Service and that his claims have been properly settled. His total service in the Territorial Force is Two years 332 days, including Two years 332 days embodied service. Service abroad, viz., France. One year 123 days. (Signature of Officer Commanding Unit) H. Harper* 2/Lt for LIEUT COLONEL: OFFICE 1/0 TERRITORIAL FORCE RECORDS. LICHFIELD. * Here state cause of discharge as detailed a) for peace conditions in the Regulations for the Territorial Force, or b) during a period of embodiment in para 392 King’s Regns. The Officer in charge of Territorial Records in Lichfield, 2/Lt H. Harper, made two errors in Pte Bertie Hibbett’s Discharge Certificate, which would have disappointed my father. Firstly the mis-spelling of his surname. His great grandfather William Hibbett born c 1792 was the first ‘Hibbett’ in our Family Line. Up until then ‘Ibbot’, ‘Hibbot’, ‘Hibbitt’ & ‘Hibbert’ spellings appear in 17th & 18th Century family records. Secondly, Pte Bertie served in Flanders as well as in France. As a child, I thought he fought in just one place. Readers of the Hibbett Letters however will know that Pte Bertie Hibbett 1/5th South Staffs was marched back & forth to fight all along the Western Front, between Ypres in Flanders and Arras in France. He first entered the trenches at Armentiers, in April 1915. By May 1916, he was South East of Arras at Fonquevilers opposite Gommecourt, preparing for the Battle of Somme, 1st July, 1916. In the Certificate Pte Bertie’s number is 200245, whereas on enlistment in 1914 it was 8823. This change in number often occurred when a soldier had been away from his Unit for some time i.e. 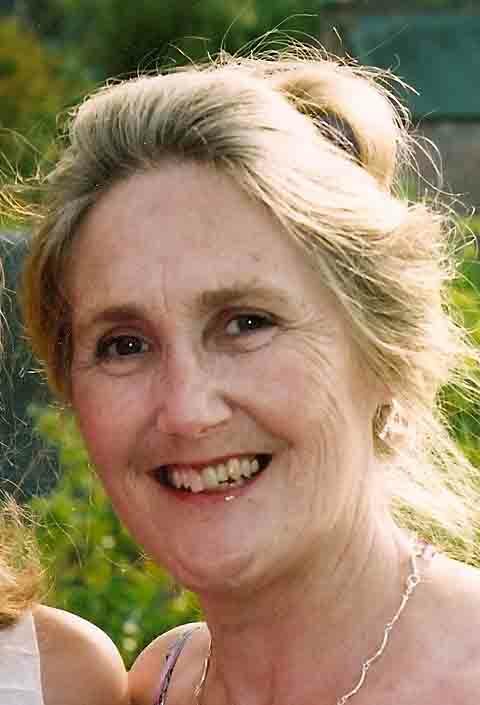 in Hospital, transferred to a different Unit or back Home to the UK. The Army was desperately short of men in 1917 hence the Notice on the reverse of the Discharge Certificate calling all discharged soldiers who are physically fit to consider returning to the Colours. TRANSCRIPT :- NOTICE. The attention of soldiers who have taken their discharge on termination of engagement, but who are physically fit for service, is drawn to the great need for trained men with largely expanded armies which have been called into being since the Outbreak of War. 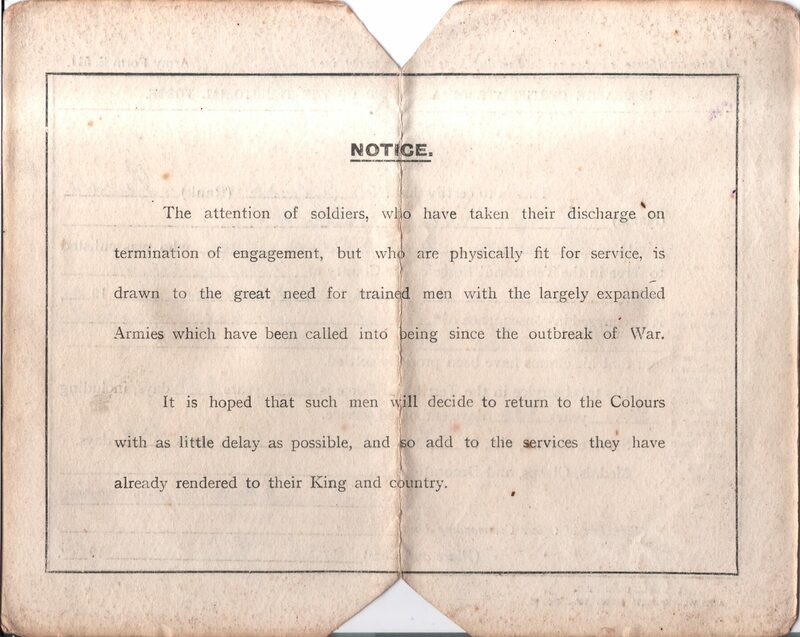 It is hoped that such men will decide to return to the Colours with as little delay as possible and so add to the service they have already rendered to their King and country. 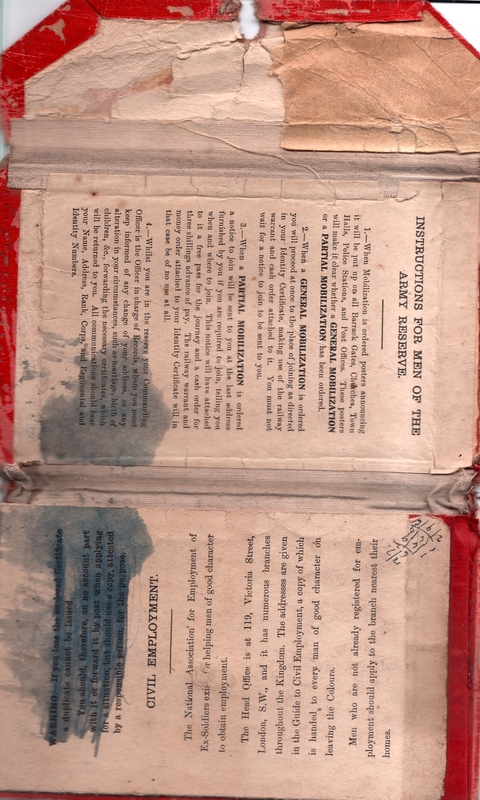 Pte Bertie Hibbett’s Discharge Document Case. My father’s Discharge Case is very worn & damaged with Indian ink. The Inside of the Case has various Instructions, strangely upside down to each other. 1. – When Mobilisation is ordered posters announcing it will be put up on all Barrack Gates, Churches, Town Halls, Police Stations, and Post Offices.These posters will make it clear whether a GENERAL MOBILIZATION or a PARTIAL MOBILIZATION has been ordered. 2. 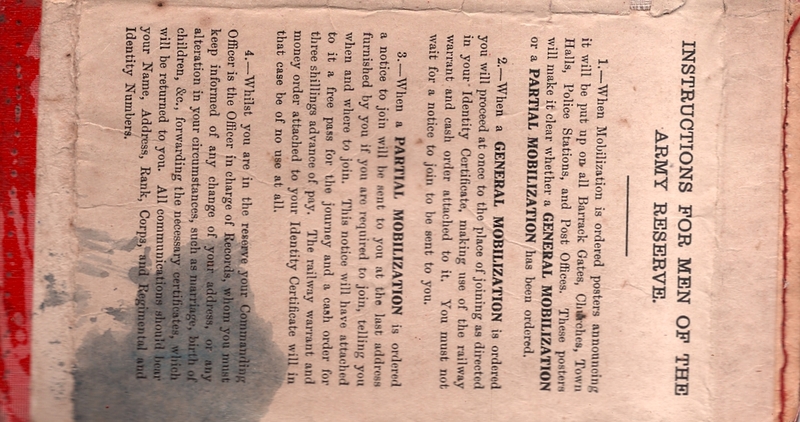 – When GENERAL MOBILIZATION is ordered you will proceed at once to the place of joining as directed in your Identity Certificate, making use of the railway warrant and cash order attached to it. You must not wait for a notice to join to be sent to you. 3. – When a PARTIAL MOBILIZATION is ordered a notice to join will be sent to you at the last address furnished by you if you are required to join, telling you when & where to join. This notice will have attached to it a free pass for the journey and a cash order for three shillings advance of pay. The railway warrant and money order attached to your Identity Certificate will in that case be of no use at all. 4. – Whilst you are in the reserve your Commanding Officer is the Officer in Charge of Records, whom you must keep informed of any change of address, or any alteration in your circumstances, such as marriage, birth of children &, forwarding the necessary certificates, which will be returned to you. All communications should bear your Name, Address, Rank, Corps, and Regimental & Identity numbers. WARNING. – If you lose the enclosed certificate a duplicate cannot be sent. You should therefore on no account part with it or forward it by post when applying for a situation, but should use a copy, attested by a responsible person, for the purpose. The National Association for the Employment of Ex-Soldiers exist for helping men of good character to obtain employment. The Head Office is at 119, Victoria Street, London, S.W., and it has numerous branches throughout the Kingdom. The addresses are given in the Guide to Civil Employment, a copy of which is handed to every man of good character on leaving the Colours. Men who are not already registered for employment should apply to the branch nearest their homes. 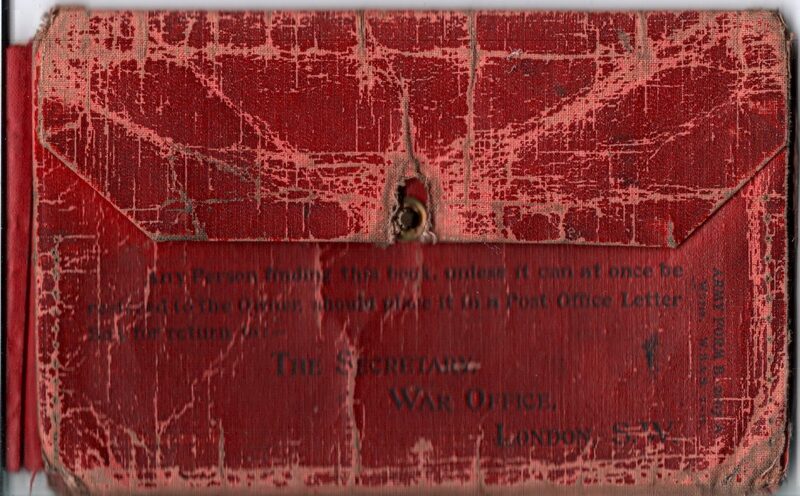 NEXT POST: 31st July, 1917. 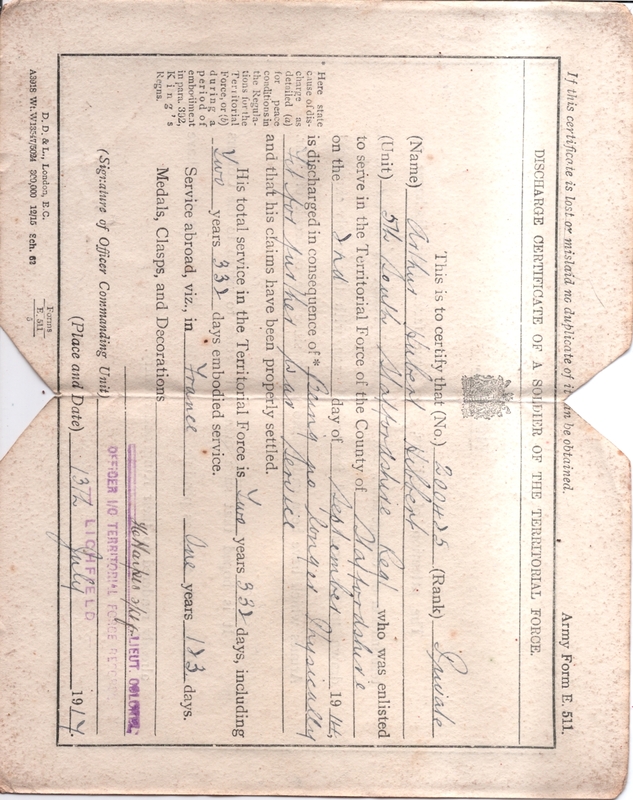 Pte Bertie Hibbett’s Army Character Certificate: ‘Very Sober, Reliable & Intelligent’. Previous Post20TH JUNE 1917: ONLY FOUR EMPTY BEDS HERE NOW – I HAVEN’T FOUND ANOTHER ARTIST YET.Next Post31ST JULY 1917: BERTIE HIBBETT’S ARMY CHARACTER: ‘SOBER, RELIABLE & INTELLIGENT’.